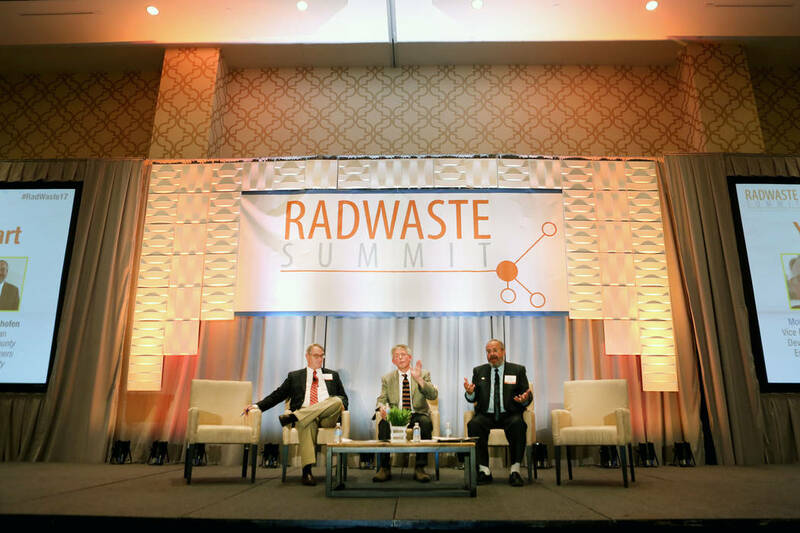 The difference in the stance on Yucca Mountain taken by the state of Nevada and Nye County came into a sharp focus at the 11th annual RadWaste summit in Summerlin. Elizabeth Brumley/Las Vegas Review-Journal Moderator and the Vice President of Strategic Development for Nuclear and Environment Eric Knox, left, executive director of the Agency for Nuclear Projects Robert J. Halstead, center, and commissioner and chairman of the Board of Nye County Dan Schinhofen, debate the pros and cons of restarting the Yucca Mountain Project at the JW Marriott hotel-casino in Las Vegas, Wednesday, Sept. 6, 2017. Elizabeth Brumley Las Vegas Review-Journal Commissioner and chairman of the Board of Nye County Dan Schinhofen speaks during a debate on restarting the Yucca Mountain Project at the JW Marriott hotel-casino in Las Vegas, Wednesday, Sept. 6, 2017. Halstead sought to straighten out facts on Yucca Mountain in his opening remarks, telling the audience that there is only a five-mile exploratory tunnel and no waste-handling facilities at Yucca Mountain. 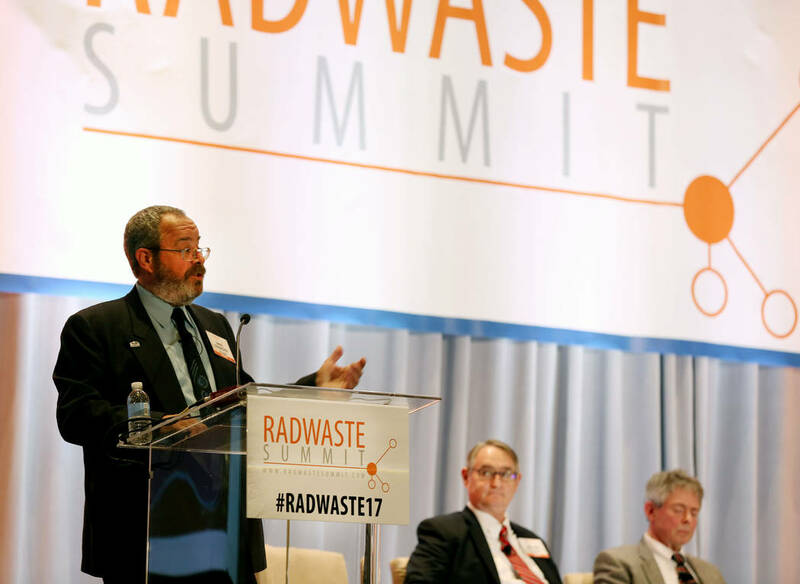 “The political opposition to Yucca Mountain in Nevada has never been stronger,” Halstead told the crowd of nuclear stakeholders on Wednesday. Nevada Gov. Brian Sandoval, state Attorney General Adam Laxalt and most of the Nevada congressional delegation with the exception of U.S. Rep. Mark Amodei, R-Carson City, oppose storing of nuclear waste at Yucca Mountain. Citing the most recent statewide poll, Halstead said that 51 percent of Nevadans were “strongly” opposed to Yucca Mountain and 23 percent of the Silver State residents were “strongly” in favor of the project. Schinhofen, one of the most vocal proponents of Yucca Mountain in Nye County, presented a different outlook. He said he stands with eight other rural Nevada counties that support vetting the science of Yucca Mountain. “We just want the law to be followed, and have that body that deals with nuclear issues to hear the science,” Schinhofen said. The suspended licensing of Yucca Mountain was another major point for discussion during the panel. Congress hasn’t appropriated any money for the Department of Energy activities associated with Yucca Mountain since 2011. The Nuclear Regulatory Commission’s licensing procedure was subsequently suspended because of lack of funds and restarted in 2013. The Trump Administration has requested $150 million for fiscal year 2018 to restart the Department of Energy Yucca Mountain program and the Nuclear Regulatory Commission’s licensing proceeding. Halstead said if the full licensing proceeding resumes, Nevada plans to adjudicate all 218 admitted contentions that were admitted by the licensing board in opposition to the Department of Energy’s licensing application in 2008. The state of Nevada plans to admit an additional 30 to 50 new contentions that challenge the Department of Energy’s previous assessment of groundwater impacts. Halstead said Nevada will also challenge the Department of Energy and Nuclear Regulatory Commission’s failure to address impacts on the Timbisha Shoshone tribe and on Native American cultural resources. Schinhofen said Nye County welcomes the state’s contentions and would be “happy” to hear them. “And we welcome them, it’s a multi-generational, multi-billion dollar project. If it’s not proven to be safe, what are you going to do,” Schinhofen said. The Republican-led House has recently approved legislation greenlighting $120 million for the Department of Energy and $30 million for Nuclear Regulatory Commission to resume the licensing process. The Senate appropriations bill however withheld funding for Yucca Mountain. “It’s not a Republican issue, it’s not a Democrat issue, it’s a national security issue,” Schinhofen said. Schinhofen said the project could build the state’s infrastructure, spark economic growth, improve the state’s education system, and bring high-paying technical jobs back to the state. Nuclear waste issue in the U.S. Most of the nation’s spent nuclear waste still sits at commercial nuclear waste reactors east of the Mississippi River, 35 years after the Nuclear Waste Policy Act was passed in 1982. Answering the question about why the state of Nevada is opposing the Yucca Mountain licensing proceeding, Halstead said there’s a “deep wound” in the state over the politics of 1987, when the government passed the Nuclear Waste Policy Amendments Act dubbed by some residents of Nevada as the “Screw Nevada” bill. The key issue in the license proceeding is whether or not the repository can prevent radioactive contamination of groundwater for one million years, Halstead said. The U.S. Environmental Protection Agency and the Nuclear Regulatory Commission’s regulations would limit radiation doses resulting from groundwater contamination to 15 millirem per year for 10,000 years and 100 millirem per year for the next 990,000 years. While the Nuclear Regulatory Commission calculates that only a small amount of contamination, 1.3 millirem per year, would occur during the first 200,000 years, Nevada’s contentions demonstrate that the 10,000-year standard could be exceeded in less than 900 years and the million-year standard could be exceeded in 2,000 years. Halstead said the U.S. Department of Energy has yet to prove what would be the expected dose of radiation to the person who drinks two liters of groundwater per day in Amargosa Valley, the closest town to Yucca Mountain. “In the end, the single most important thing that the Department of Energy has to prove is the repository that they plan to build and operate and close, will limit particularly long-lived radionuclides like plutonium, neptunium and technetium isotopes from getting into water in quantities that would result in that dose,” Halstead said. Schinhofen called to follow the Nuclear Waste Policy Amendments Act of 1987 that requires the Energy Department to move forward with the license application for Yucca Mountain. “While the state is fighting us on science, the Nuclear Waste Policy Act is still governing law and it requires the DOE to move forward a license application for Yucca Mountain,” Schinhofen said. “Doing nothing is not an option, and it’s way past time to stop putting political science over the nuclear science,” he said. 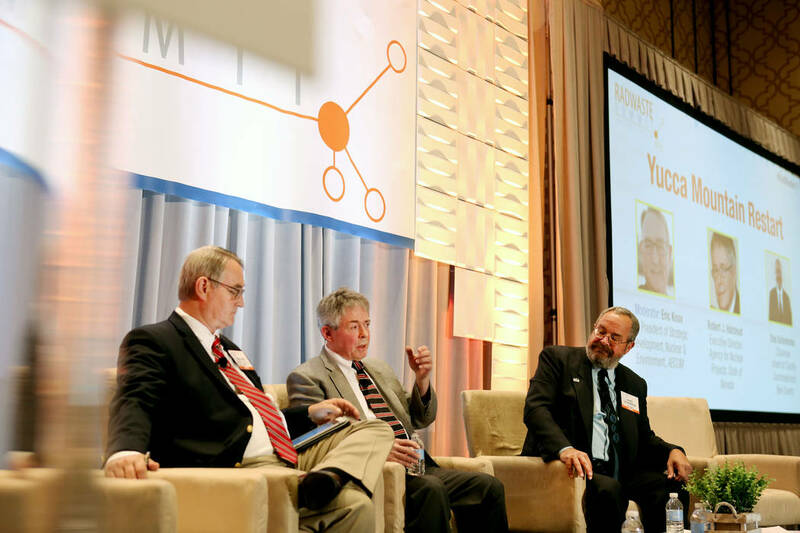 In an interview following the panel, Halstead said Nevada is now trying to show that its contentions to Yucca Mountain are based on the actual science rather than politics. In the wake of the retirement of former Sen. Harry Reid, D-Nevada, some Yucca Mountain proponents thought that Reid’s absence would change Nevada’s stance on the issue. Halstead, however, said that’s not the case. “The absence of Reid had them on cloud nine even though they didn’t know the election results, they were assuming either way. One of the unfortunate ironies that hinders Nevada is that Reid was successful in using the rules of the Senate, the appointment confirmation powers of the Senate, knowing the appropriations process,” he said. For the past seven years, there were a series of continuing resolutions, but no appropriation bills, which maximized Reid’s ability to foil the Department of Energy’s plans to move forward with the licensing proceeding by cutting off funds. Halstead said the state is opposed to opening Yucca Mountain because of its technical, safety and environmental protection issues. Nevada officials contend that Yucca Mountain is an unsuitable site for a geologic repository because of its geology and hydrology. And Nevada contentions, admitted by the Nuclear Regulatory Commission licensing boards in May 2009, challenge the Department of Energy’s proposition that engineered barriers can overcome the deficiencies in geology and hydrology. “The state’s position is that it was a wrong thing for political science to trump earth science in the selection of Yucca Mountain in the first place, and then, subsequently, there’s been a number of actions that basically lead us to conclude that we can’t trust the Department of Energy and Nuclear Regulatory Commission to make a totally and strictly technically objective decision, and therefore, we are against the Yucca Mountain license application going forward,” Halstead said.